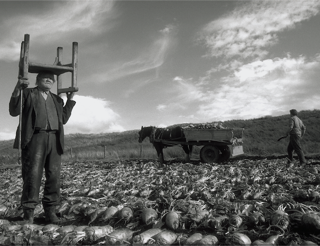 Andrew Kötting, Hastings’ master of magical realism, will be showing his film trilogy, ‘Earthworks’ on Saturday 17 November at the Towner Art Gallery Cinema: an all-day event, starting at 11am, in conjunction with Brighton Cinecity. HOT’s Chandra Masoliver, who interviewed Andrew Kötting a couple of months ago, suggests these are highly evocative films, not to be missed. The Towner Art Gallery announces that following Andrew Kötting’s exhibition last year, he will return to the Towner for one day only, presenting a rare opportunity to see his Earthworks trilogy in its entirety. 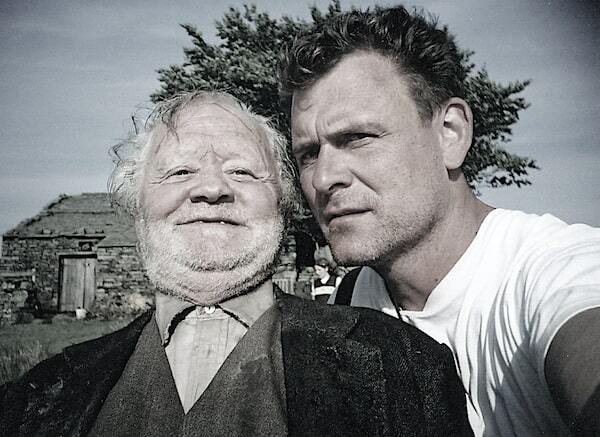 The day is dedicated to Dudley Sutton – a dear friend of Andrew’s, who died recently and who, he says, “gave me the confidence to work with ‘proper’ actors”. Kötting will himself be present for the whole day. A tragic tale of rural passion and survival, inspired by Emile Zola’s novel, La Terre and John Berger’s, Pig Earth. The film tells the story of sisters Kath and Francine, whose lives are disrupted by two men – a brutal villager greedy for the girls’ land and a gentle stranger who offers the possibility of escape. Amidst a landscape of rural hardship and a community consumed with superstition, events unfurl which threaten their sibling bond. (15) 2009. 88 mins. French with English Subtitles. Set in the French Pyrenees, Ivul is an intriguing family drama in which the intense relationship between teenage siblings, Alex and Freya incurs the rage of their authoritarian father. After a huge quarrel, Alex climbs onto the roof of the house and vows never again to set foot on the earth. He lives out a brief and dramatic life in exile, looking down upon a family that he loves but is too stubborn to return to. (15) 2017. 92 mins. English and Russian with English Subtitles. Based on the award-winning play by Hattie Naylor and inspired by the true story of Ivan Mishukov, who walked out of his apartment at the age of four and spent two years on the city streets, where he was adopted by a pack of wild dogs. 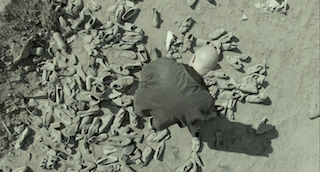 With trace elements of Tarkovsky’s Stalker and Samuel Beckett’s Krapp’s Last Tape, Kötting’s spellbinding and utterly original story of survival draws on home movies and archive to produce a montage essay on the state of the world. The showing of the trilogy will be followed by a Q&A with Andrew Kötting and Jason Wood, Artistic Director of Film at HOME in Manchester. THIS FILTHY EARTH / IVUL– £8.50 standard / £7 conc. LEK AND THE DOGS + Q&A – £10 standard / £8 conc. The trilogy’s accompanying book, Earthworks Bookwork (hereon–hereover–hereunder–hereafter), will also be available to buy from the Towner shop at a reduced rate, for those that attend any of the screenings. Chandra Masoliver’s interview with Andrew Kötting here.